Match 62, Do or Die match for Pune warriors, Win in this match will keep Pune’s chances alive (Mathematically at least). Sangakarra won the toss for one last time for this season, and decided to field first, Pune threw the game away after a very good start, as they crumbled from 30/0 in 4 overs to 45/5 in 8 overs. From then on, Yuvi tried to bring back the game, later Wayne Parnell helped on the same cause, to get Pune to 136/9 in 20 overs. Deccan’s top order found the form finally as all the four chipped in to finish of the hopes of Pune to make it to the play offs. Sangakarra will be a happy man to win the game just before leaving this season of IPL to England. – 17 wides by Danial Christian is the highest by any bowler in this tournament, but he didn’t bowl one today. – Amit Mishra became the 5th bowler in this tournament to pick up a double wicket maiden and also the 26th maiden overall of this season. – Sourav Ganguly scored the first duck of this season. – Deccan has won their first match by chasing in this season and ironically, Pune yet to win their first match batting first. – Pune Warriors are the fourth team officially to be eliminated from this season of IPL. – Score of 23 looked to be the bad omen for the day as three batsmen are dismissed in this score, Duminy, Yuvaraj and Manish Pandey being the victims. 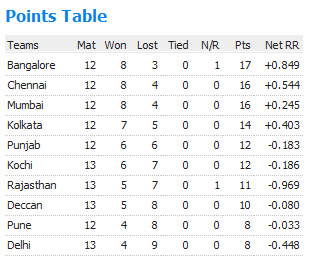 – Mithun Manhas scored the 4th duck of this season, and now officially he is with maximum no.of ducks for this season.